Whenever somebody says “gaming PC”, the first thing to pop into your mind would probably be a stylish case lined with multiple RGB fans. 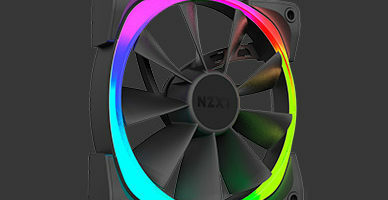 But even if we disregard the aesthetic appeal that stems from RGB lighting, case fans are still crucial when it comes to keeping your PC cool. 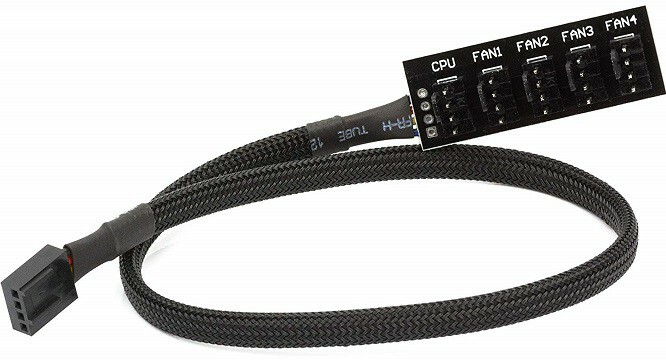 However, adding multiple fans to a PC can be problematic if your motherboard does not have enough fan connectors, and that’s precisely where fan controllers come in. Not only do they provide you with additional connectors, but they also make controlling the fans easier! In this article, we will be bringing several of the very best fan controllers for gaming that you can get in 2019! The first on our list is a simple fan controller from CRJ Electronics dubbed “Blackout”. 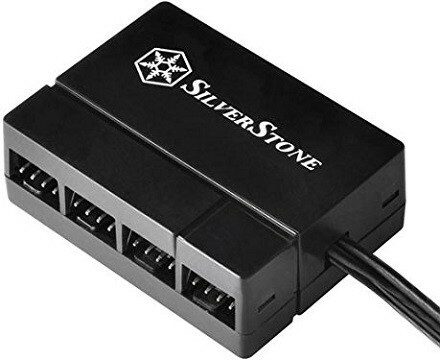 As you can see from the picture above, it is a highly compact one that connects to a single 4-pin port via a braided cable, and it provides the user with a total of five fan connectors. As for mounting, it can be easily attached to the interior of the case with the help of the 3M adhesive mounting pad on the back. Now, given that it is an extremely affordable low-end solution, it is by no means a perfect product. The only major thing to take note of is that PWM is limited to only one channel. What this means is that all of the connected fans will spin at the same speed as the CPU fan, unless their speed is adjusted manually. All in all, the CRJ Blackout is a good but very basic solution that we’d recommend mainly to those who have motherboards with a limited number of fan connectors. Anyone looking for more control over their case fans should look to something with a higher price tag. This fan controller made by Electop is a solution quite similar to the CRJ Blackout in that it is also a highly affordable and generally simple product. But obviously, it differs in the fact that it supports a total of 10 fans, as opposed to the Blackout’s 5. Moreover, due to the high number of fans, it also draws power via a SATA connector. While the product does what it’s designed to do, there are some concerns regarding its long-term reliability. 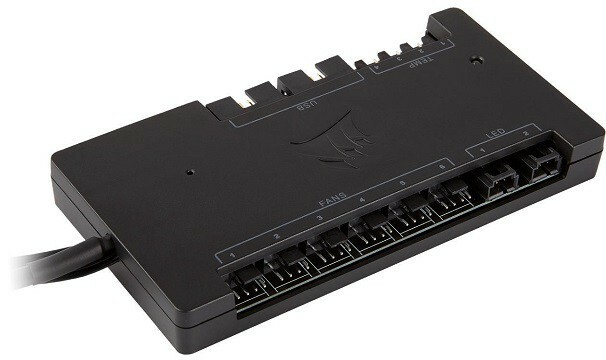 Of course, some issues with the build quality are to be expected given the high number of connectors in such a low-priced fan controller, but it is definitely something to keep in mind if you’re planning on getting a fan controller for the long-term. And, like the Blackout, it is limited to only one channel. 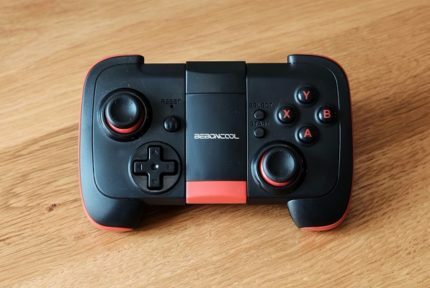 Needless to say, this is the ideal controller for those who need to connect a large number of fans but don’t want to spend too much on a fan controller. But, as always, you get what you pay for. This Electop product will get the job done, but chances are that you might need a replacement a bit further down the road. The Thermaltake Commander FX is an affordable internal fan controller similar to the Electop one, but it makes some important changes that ultimately make it a better investment, at least as far as we’re concerned. It, too, has a total of 10 fan connectors, but it has proven to be more reliable in the long run and it even sports a fairly sturdy matte black plastic exterior. The only real downside is the fact that it comes equipped with 3-pin connectors rather than 4-pin ones. This means there is no PWM support i.e. the fan speeds cannot be adjusted automatically based on temperature readings. At the end of the day, this is a great-looking and highly functional fan controller which would make an excellent purchase, provided that you don’t mind being stuck with manual fan control. Next up, we have the FPX-001 which is made by Kingwin. This is a compact front panel fan controller that is meant to be installed in a 3.5-inch drive bay and supports up to four sets of fans. It has four dedicated speed control knobs on the front for easy manual fan speed control. 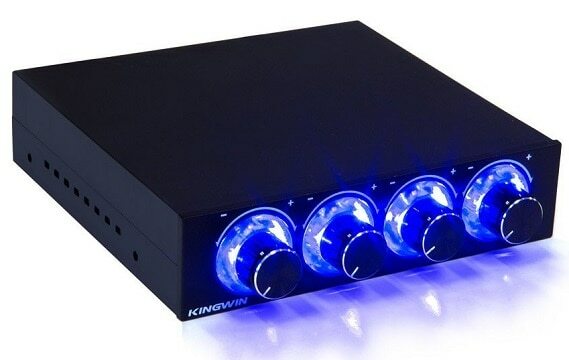 As a plus, each knob has its own separate blue LED light, which does give it some nice flair. The FPX-001 works well in itself, but there are some long-term reliability issues. Namely, the product is made primarily of plastic and is overall somewhat cheaply constructed. Not only that, but some users also report overheating issues, something that can definitely lead to a shorter life-span of the product. And while there is no PWM support here either, that isn’t as big of an issue since the fans are very easy to control with the help of the knobs. All in all, if you’re not too demanding of a user, this fan controller might be a good match for you. It looks good, supports a decent number of fans, and allows simple manual control at a fairly low price. But sadly, the cheap build quality is what cements its status as a budget product that will only appeal to casual users. And now, we have something that many find to be one of the very best fan controllers currently on the market – the NZXT Sentry 3. It is another front panel fan controller that comes equipped with a quality capacitive touchscreen. It has five fan connectors and five channels, complete with its own temperature sensor. The Sentry 3 is an overall very well-rounded product with no major flaws in terms of functionality. The LCD display is not the best, mainly because of the poor viewing angles. Of course, this is not a major issue, since it’s not like you need to be viewing it from your seat at all times while gaming. All in all, the Sentry 3 is one great fan controller, especially considering the price. It combines functionality and aesthetics in one very efficient product, and viewing angles are hardly the key factor that you’d keep in mind when shopping for a fan controller. The Corsair Commander Pro is an internal fan controller that places an accent on functionality. 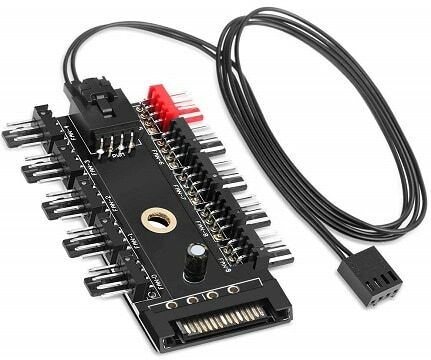 Not only does it come with a total of six 4-pin fan connectors, but it also has two connectors for RGB lighting, two USB 2.0 headers, and four separate thermistor inputs for those who might want more accurate temperature monitoring. Furthermore, it uses the excellent Corsair Link software as a means of controlling all the connected internals. In between the excellent build quality, high versatility, and functionality, as well as the highly meticulous control software, there are no glaring flaws to speak of. But, as is usually the case with such high-quality products, the high price tag is what ends up keeping the less demanding, budget-conscious users away. All things considered, if you want the very best and don’t lament the cost, then this is the way to go. The Commander Pro is flexible, reliable, and feature-packed, implementing pretty much every possible feature that you could want out of a fan controller. 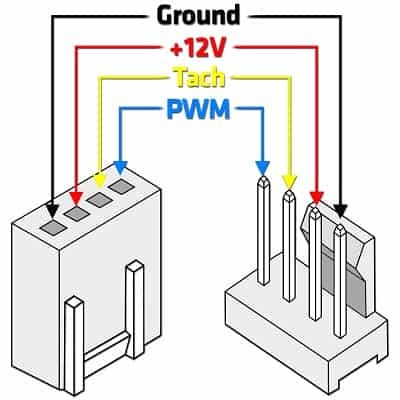 PWM is an important factor to consider when getting a fan controller, and whether a controller supports PWM depends entirely on whether it comes with 3-pin or 4-pin connectors, as it is only the latter that support PWM. Now, PWM (pulse-width modulation) is, in layman’s terms, what allows the computer to automatically regulate fan speed based on temperature readings. Without PWM, fan speed can only be adjusted manually through the motherboard BIOS, via software designed for that purpose, or with the help of manual controls such as knobs or a touch screen. Now, for the key question: do you need it? Well, PWM is not as important for case fans as it is for CPU and GPU coolers, at least not as far as performance is concerned. After all, a case fan’s purpose is to improve the airflow inside the case, and unless you’re doing some heavy overclocking, a non-PWM fan set to rotate at a specific speed will do the job just fine, although that might not be the most power-efficient nor the quietest solution. When all is said and done, if we had to pick the single best fan controller out of all the ones listed here, we’d have to go with the NZXT Sentry 3. Overall, we find it to be the most versatile controller currently available and has more than enough connectors and features for most users’ needs. But of course, which fan controller you’ll pick depends mostly on your own needs. A no-frills controller such as the CRJ Blackout might be a better fit for casual users, whereas enthusiasts will undoubtedly go for the Corsair Commander Pro. Rest assured that, whichever one of these you choose, you won’t be disappointed – as long as you keep your own needs and the controller’s shortcomings in mind, that is. Also, if you’re shopping for some new case fans, check out our list of the best case fans currently available, too!